John Munro is a lighting designer for theatre, opera, and dance, who has worked in Canada, the United States, and Europe. He has worked with various theatre companies, including Stratford Festival, Canadian Stage, Grand Theatre, Theatre New Brunswick, Theatre Calgary, The Citadel Theatre, Neptune Theatre, Centaur Theatre, and the National Arts Centre. 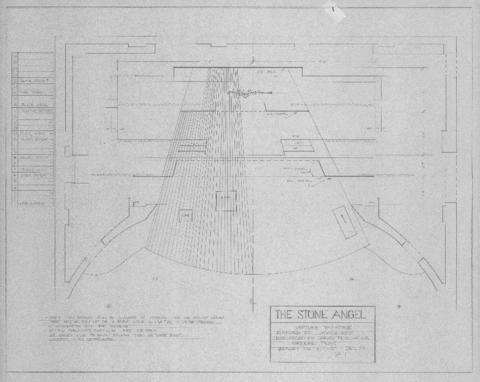 File contains set designs for Neptune Theatre's production of "The Stone Angel," directed by James Roy and designed by Brian Perchaluk. The file includes Perchaluk's original drawings, annotated copies of pages 1 and 2, and a copy of the light design plot by John Munro. See the production records for this play in the Neptune Theatre fonds (MS-3-1) under the series "Production records," subseries "Stone Angel" and "The Stone Angel."